1. Place spelt berries in a pot and cover with water to 2 inches above the berries. Bring to a boil and then simmer on medium until tender, about 35-45 minutes. Add more water if necessary. 2. Meanwhile, chop and prepare your veggies. In a medium sized bowl, stir together the chopped carrots, olive oil, minced garlic cloves, lemon juice, vinegar, cumin, paprika, red pepper ﬂakes and raisins. Stir well and add into a large saucepan. Cook on medium heat for about 5 minutes or so. You just want to lightly cook this mixture. After about 5 minutes of cooking, place back into the bowl. 3. 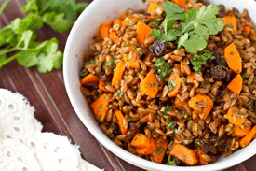 When the spelt berries are cooked, drain and rinse, then stir them into the carrot mixture. Stir in the cilantro, salt, and pepper to taste and adjust seasonings if necessary. Serve warm or cold and enjoy!